I was SUPER excited to team up with Red Ted Art, Imagination Soup, Imagination Tree & Tinkerlab to bring you Kids Get Arty - a bi-monthly link up which is meant to encourage exploration of the great artists! I was planning on exposing the Lil Divas to some of our great artists as well as different works of art. This is a fabulous way for us to keep motivated and share our experience with our fabulous readers. Then the Lil Divas each one of their favorite pieces to recreate. I was a bit worried about how it would go. They expressed concern about doing it "right" and it not looking like the original work. I emphasized that there was no "wrong" way to do this and I wanted them to do it their way. The point was to explore doing something new, discover new artists and learn a thing or two along the way. 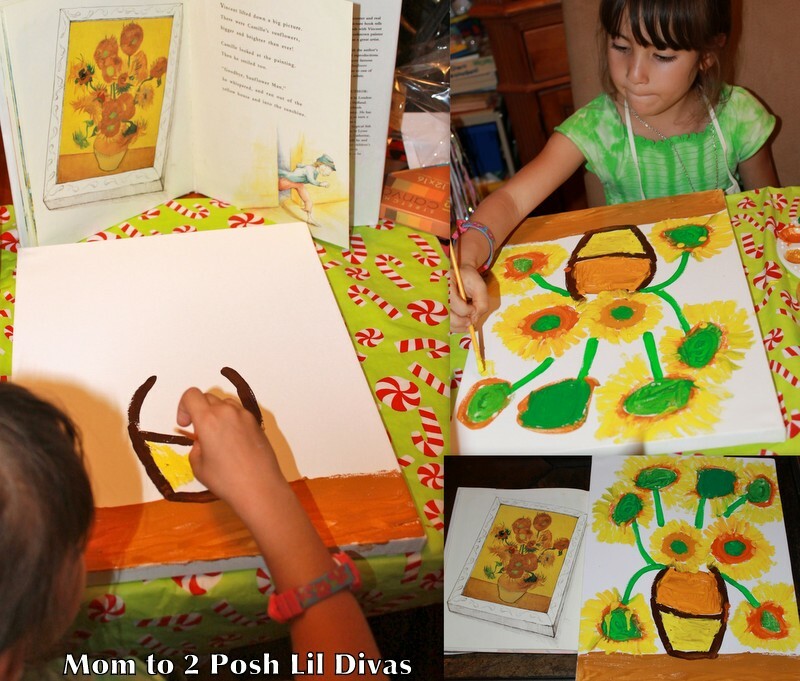 The Lil Divas had their first experience with oil paint on canvas. Once they got a feel for it & just let loose - it was awesome! 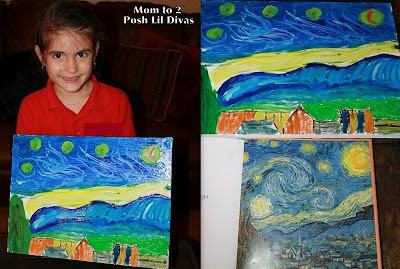 The Oldest Diva decided to recreate "Starry Night" a painting she had learned about at school. 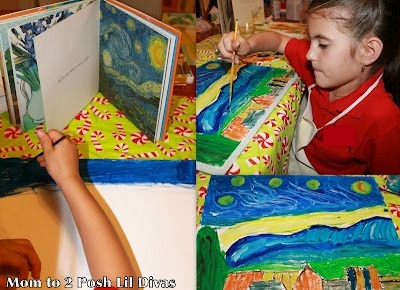 Using a picture from one of the books we read, she used oil paints on canvas to recreate her own "Starry Night". She was very concerned at first that hers did not look like the photo as she worked. I told her to use small strokes and not worry so much about blending them in and that helped a little. She was very proud of her final masterpiece & with good reason! I think she did a great job capturing the essence of the piece at only 6 years old. 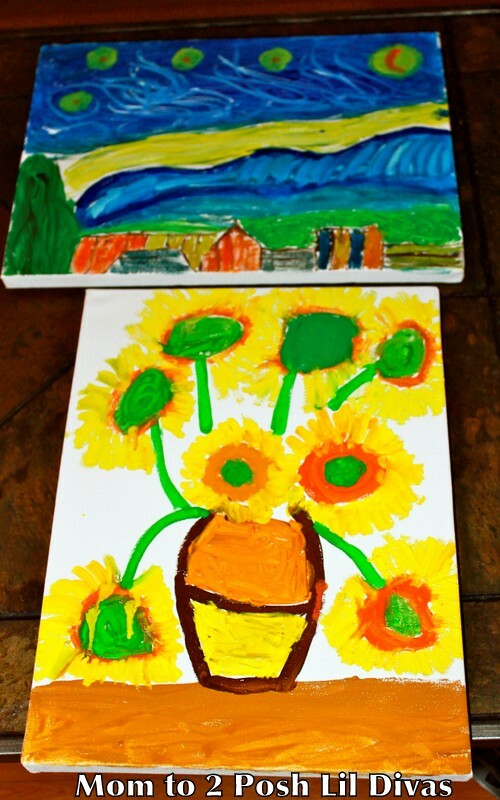 The Littlest Diva opted to recreate Van Gogh's "Sunflowers"
She was so excited about her happy sunflowers! and I am a proud Mama. and our first challenge was wildly successful and encouraging. I can't wait until our next challenge in July - we shall be exploring.....? 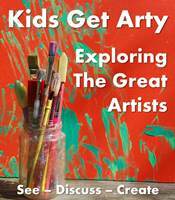 Explore a Great Artist of your choosing & then Get Arty with your kids. Then show us what you did by joining in our linky party (see below). Can't wait to see what everyone has been up to! These are beautiful!! I love them. How fabulous that you let them have a go at oil paints. Brilliant. I adore the starry night painting (well, I adore both). Just perfect. So fab to have you co host :-) thank you! Looking forward to the next Kids Get Arty in July! thanks Maggy! We had a great time with this - looking forward to the next one! Your girls' paintings look fantastic! Thank you MaryAnne - they are quite proud of their first canvas paintings! Wow, your girls are quite talented!! Those paintings are divine! (We did something with Van Gogh also, but used a different technique.) I truly love what your kiddos created! Can't wait to see what you did! Thank you! Oh my goodness!!! Their paintings are incredible!!! 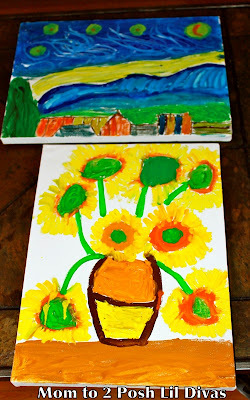 Totally inspired to try oil paintings with the kids. Fantastic! Thanks Megan. It took a little getting used to but once they got going, they really enjoyed it. I think it helped to have a plan in mind. Both the paintings look fantastic!! Inspired to try some with my daughter. Roopa, I know you will both enjoy it - be sure to let me know when you do! Starry night is my all-time favourite Van Gogh painting, so atmospheric and aesthetic. Beautiful. Bern, I love this! Pinned it. What a great resource.